Image caption Google has said the "right to be forgotten" process is "difficult" and "evolving"
After widespread criticism, Google has begun reinstating some links it had earlier removed under the controversial "right to be forgotten" ruling. Articles posted online by the Guardian newspaper were removed earlier this week, but have now returned fully to the search engine. 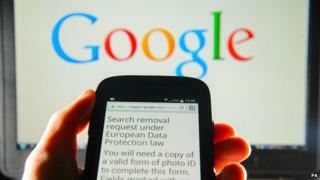 Google has defended its actions, saying that it was a "difficult" process. "We are learning as we go," Peter Barron, head of communications for Google in Europe, told the BBC. Speaking to Radio 4's Today programme, he dismissed claims made on Thursday that the company was simply letting all requests through in an attempt to show its disapproval at the ruling. "Absolutely not," he said. "We are aiming to deal with it as responsibly as possible. "The European Court of Justice [ECJ] ruling was not something that we welcomed, that we wanted - but it is now the law in Europe and we are obliged to comply with that law." He said Google had to balance the need for transparency with the need to protect people's identity. Mr Barron argued that the search giant was doing its best to comply with the ECJ's ruling, which stated that links to web pages can be removed from search engine if they are deemed to be "outdated, irrelevant or no longer relevant". The ruling has come under particular scrutiny after BBC economics editor Robert Peston was notified that a blog post he had written in 2007 would be removed from appearing when a specific search was carried out on Google. The identity of the person who made the request is not yet known, although Google has confirmed it is not the subject of the article, former Merrill Lynch boss Stan O'Neal. In addition to Peston's blog, seven other BBC articles were singled out for removal, most of which included comment threads. Elsewhere, the Guardian's special projects editor James Ball wrote that six of the newspaper's articles had "fallen down the memory hole". A source has confirmed to the BBC that the Guardian articles have now been re-indexed for all relevant search terms. Mr Ball joined those saying that Google's actions may have been "tactical". "There are very few news organisations in the world who are happy to hear their output is being stifled," he said. "A few automated messages later, the story is back in the headlines - and Google is likely to be happy about that." His thoughts echoed those of Ryan Heath, spokesman for the European Commission's vice-president, who described the decision to remove a link to Peston's blog as "not a good judgement". "It doesn't come cheap to deal with all of these requests, so they need to find some way to come up with dealing with them." He added that the ruling should not allow people to "Photoshop their lives".